Deck includes outdoor seating and BBQ. Pool room with Smart TV, library, games and more fun! Game room with pool table, Smart TV, library, games and more fun! Game room can serve as private 4th bedroom. Game room has fun for all ages. View of living room and kitchen. Living room also includes TV. Dining for 4 at the table. Extra chairs at breakfast bar. Table and breakfast bar accommodates dining for 8. Desk in master bedroom makes for perfect office space. 2-3 cars can fit in this parking space. 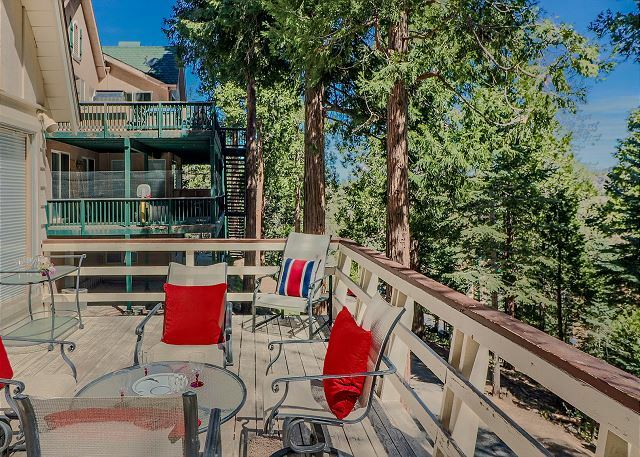 Experience the essence of beautiful Lake Arrowhead at "The Summerhill Cottage". 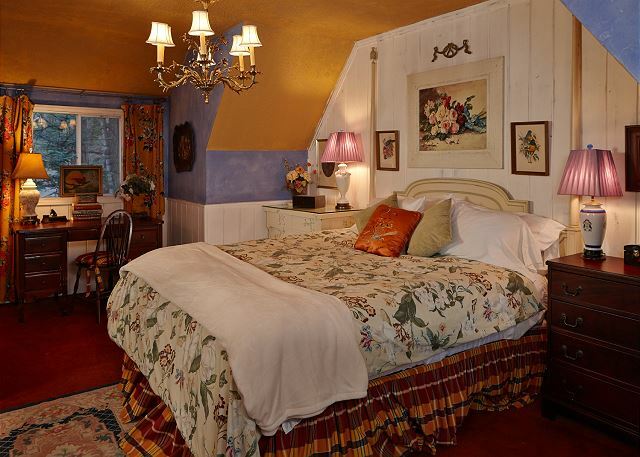 Featuring French Provencal décor, the "Summerhill Cottage" will take you back in time. With three bedrooms (1 King, and 2 Queen beds) and 2 baths, the home offers plenty of room for the family. 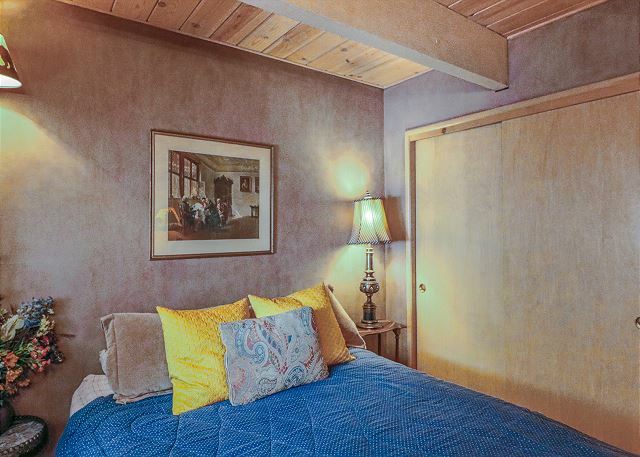 The cottage sleeps 6 in beds with a double-wide sofa and air mattress to accommodate four extra guests. 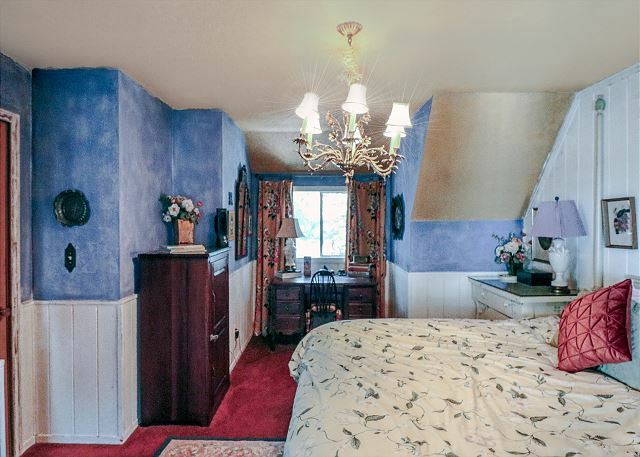 Televisions accommodate both the master and second bedrooms. 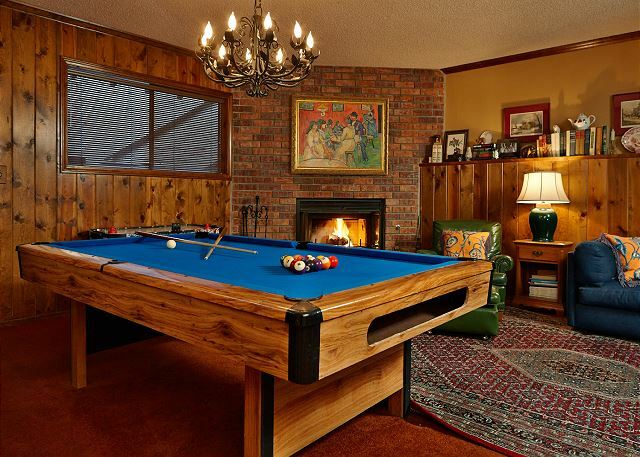 The game room has a 42” flat screen TV, pool table and a wood burning fireplace. 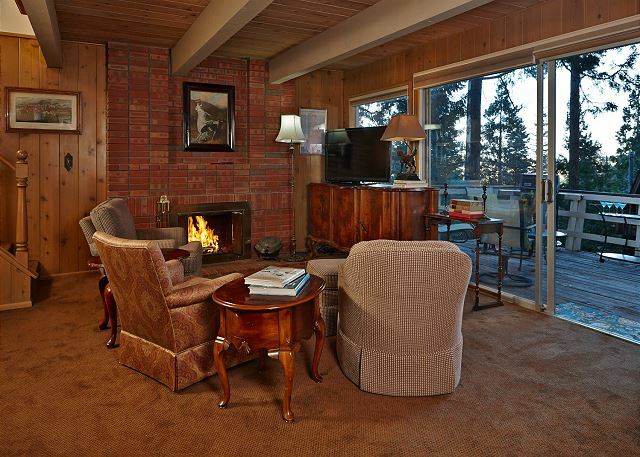 Relax in the living room in front of the fireplace while watching your favorite shows on another 42” flat screen TV. Entertain family and friends out on the deck featuring a grill for summer BBQs. The cottage includes all of the following accommodations to meet your every need: microwave, washer/dryer, dishwasher, linens, full kitchen, and cable/internet. Summerhill Cottage is truly your home away from home. This cottage is located in beautiful Arrowhead Woods and slightly off the beaten path for just the right amount of privacy. 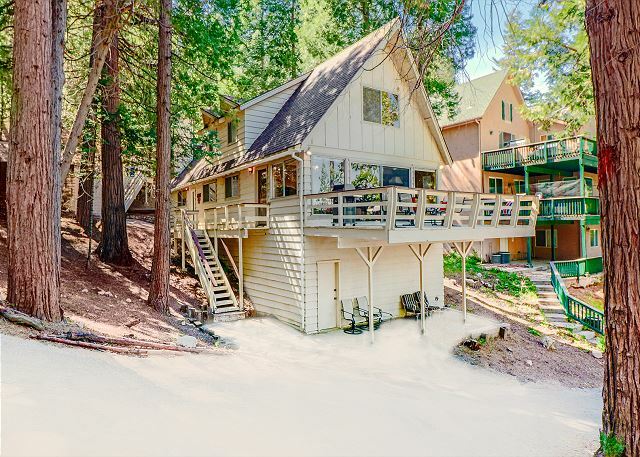 Rental of this cabin comes with private Lake Arrowhead beach access. Double-wide sofa and air mattress upon request. Closest to: Golf Course & Country Club, Blue Jay Village (shopping, dining, movie theater). Less than 1.5 miles from: Lake Arrowhead Village (shopping, dining, entertainment), Lake Arrowhead (boating, swimming, walking, hiking, Ice Castle (ice skating). Less than 10 miles from: Lake Gregory (public swimming, boating, walking, hiking, dog park, community events, Crestline (bowling, shopping, dining), Running Springs (shopping, dining, hiking). Less than 20 miles from: Big Bear (skiing, shopping, boating, dining, hiking). 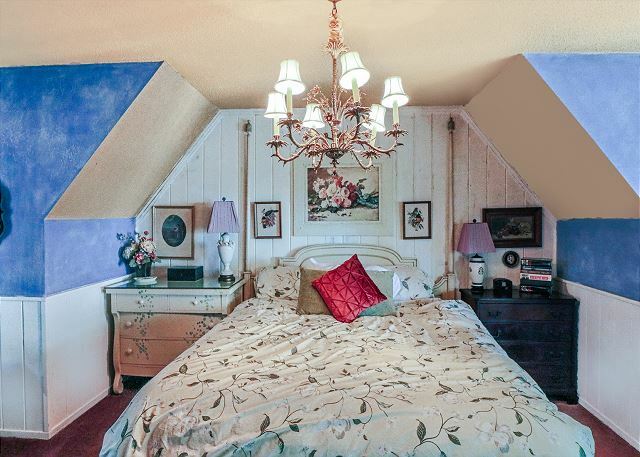 Weekend rate Friday/Saturday is $250.00 p/night. Weekday rate Sunday thru Thursday is $200.00 p/night. Winter Holiday rate $350.00 p/night (Thanksgiving, Christmas and for New Year's, with a 4 night minimum). Holiday rate $325.00 p/night, a 3 day minimum may be required. Call us for our weekly/monthly specials. Pets are welcome. Pet fee of $25-35 per pet/per day will apply. Linen/Prep fee $150.00. Got upgraded to this property and it was perfect for the occasion. The house was clean and had everything we needed. Good parking (we fit 4 cars). The neighbors cute big dogs were a little annoying when we were on the deck, but other than that it was a great stay. My second time staying here. Been to many other places but our family always prefers Summerhill. Nice,spacious, pool table is an added bonus,balcony is nice,we enjoy our morning coffee out there with great scenery. Overall its a nice getaway place to stay. Highly recommend. Everyone in my family really enjoy this one beautiful cottage. The surrounding is just unreal. Great getaway place from your everyday chaotic world. My family wants to come back again very soon. Great price for this great place help. the house was lovely, monica was very easy and friendly to communicate with. I'd stay there again! Really enjoyed staying here. Kitchen and house were well stocked and a lot of space to hang out with our party. Pool room gives a nice second area to gather. Living room has nice views over the deck. Good house for a small group to hang out, it snowed our whole weekend so we spent a lot of time in the house and it met our expectations. 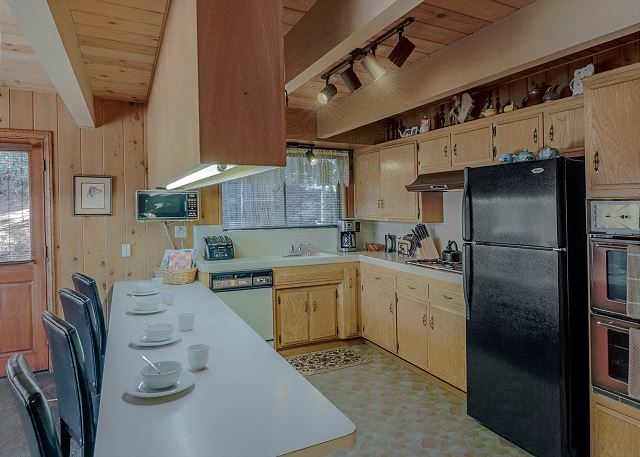 A lot of the appliances and decor are older, but all in excellent condition and work well so I cannot complain. Plus I like the style. However, I know some people may want to know that ahead of time. Excellent location close to downtown and the lake. If you are expecting snow, bring chains, the access road to the house is very steep and narrow. 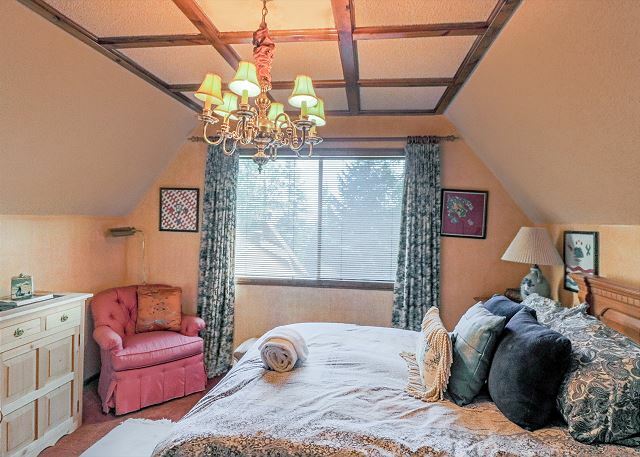 A very charming and quaint property in the woods around Lake Arrowhead. Everything you could possibly require is provided for and you are in for a very calm and relaxing stay if you pick this cottage.